Meet Misha Vainberg, aka Snack Daddy, a 325-pound disaster of a human being, son of the 1,238th-richest man in Russia, proud holder of a degree in multicultural studies from Accidental College, USA (don’t even ask), and patriot of no country save the great City of New York. Poor Misha just wants to live in the South Bronx with his hot Latina girlfriend, but after his gangster father murders an Oklahoma businessman in Russia, all hopes of a U.S. visa are lost. Salvation lies in the tiny, oil-rich nation of Absurdistan, where a crooked consular officer will sell Misha a Belgian passport. But after a civil war breaks out between two competing ethnic groups and a local warlord installs hapless Misha as minister of multicultural affairs, our hero soon finds himself covered in oil, fighting for his life, falling in love, and trying to figure out if a normal life is still possible in the twenty-first century. With the enormous success of The Russian Debutante’s Handbook, Gary Shteyngart established himself as a central figure in today’s literary world—“one of the most talented and entertaining writers of his generation,” according to The New York Observer. 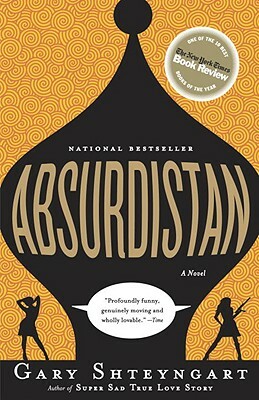 In Absurdistan, he delivers an even funnier and wiser literary performance. Misha Vainberg is a hero for the new century, a glimmer of humanity in a world of dashed hopes.